​October 30, 2014, Hong Kong – Asian investors are on track to spend more on U.S. multifamily assets in 2014 than at any other point in history, according to the latest research from CBRE. U.S. multifamily has seen a significant increase in investment volumes by Asian buyers so far in 2014, with US$522 million of transactions completed from January through August. This figure has already surpassed the full year total for 2012 (US$356 million) by a considerable margin and is close to bettering the 2013 total (US$537 million). The jump in buying activity by Asian investors, particularly from Japan and China, is the most significant shift in terms of buyer nationality in 2014. Asian investors are now responsible for 18% of cross-regional multifamily investment in the U.S.—an increase of 8%—as purchases by European and Middle Eastern countries decline slightly. 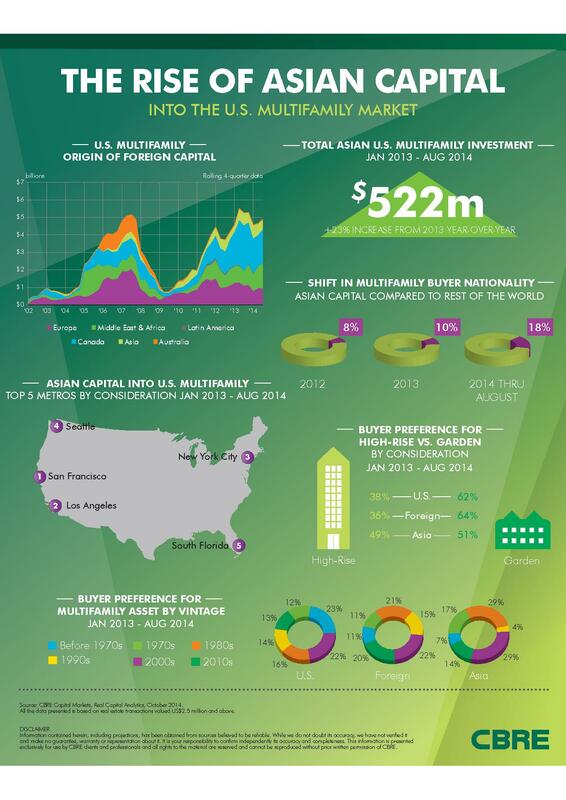 Canada continues to be the overall leader in foreign multifamily investment into the U.S. Since January 2013, Asian buyers have targeted a range of multifamily assets in U.S. locations, with San Francisco attracting the most investment at more than US$326 million, followed by Los Angeles at US$252 million and New York at US$175 million. Asian investors have been focused on single assets with just one of the 27 multifamily acquisitions in this time period a portfolio, compared to investors from the rest of the world who made at least 20% of their acquisitions in portfolio assets. Cross-border buyers overall have targeted a range of multifamily assets in U.S. locations since January 2013, with the majority of cross-border multifamily investment to date in 2014 being made in primary and secondary metros. This is in contrast to 2013 when secondary and tertiary metro acquisitions dominated the first eight months of the year. Cross-border investors have preferred purchasing newly built core/core-plus product in 2014, compared to a significantly greater focus on slightly older core-plus/value-add product in 2013.